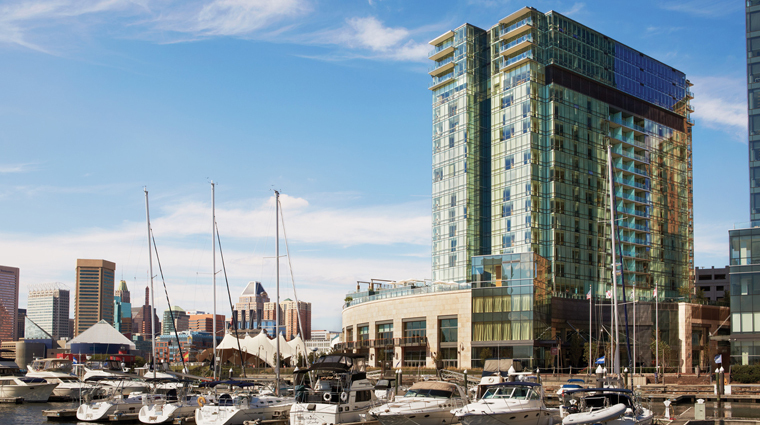 Four Seasons Hotel Baltimore’s gleaming, waterfront glass tower offers happy respite to guests who’ve spent the day wandering Inner Harbor and the area’s chic eateries and boutiques. 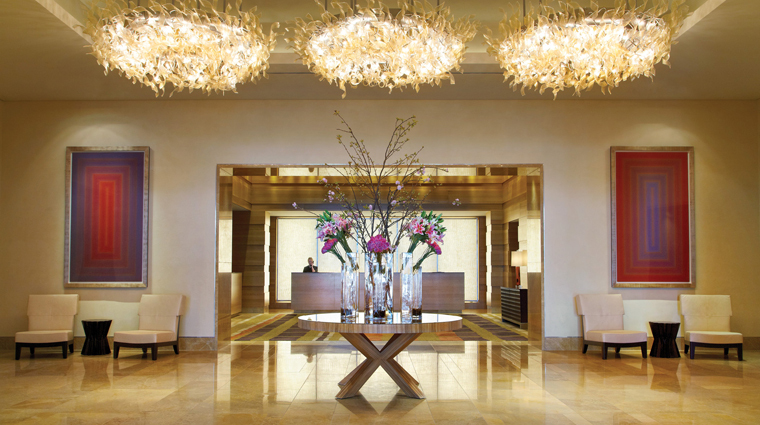 A destination unto itself, the hotel lobby showcases a museum-quality art collection, and the guest rooms’ floor-to-ceiling windows provide some of the best harbor and city views in the region. 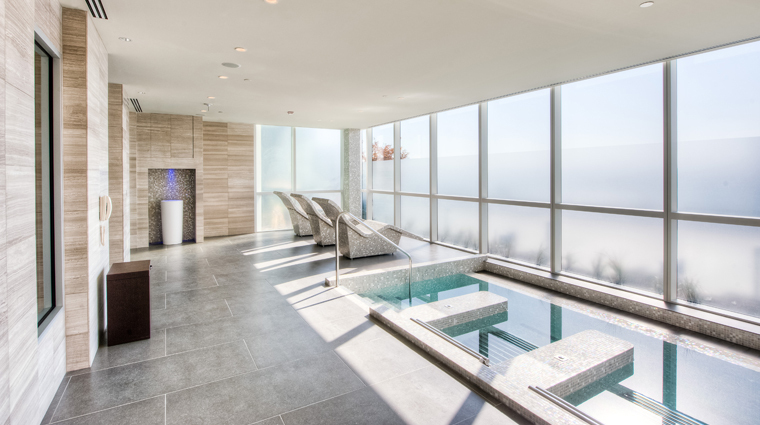 The hotel’s fourth floor hosts a dreamy spa (don’t miss the submerged Jacuzzi loungers) and a 24-hour state-of-the-art fitness center. A passage between the spa and the gym spills out onto the Splash Terrace, where you are treated to the city’s only waterfront infinity pool, a hot tub, a wading pool and private cabanas. The Harbor East neighborhood where the hotel is located is also an up-and-coming area with many trendy boutiques, restaurants and spanking new apartment complexes. 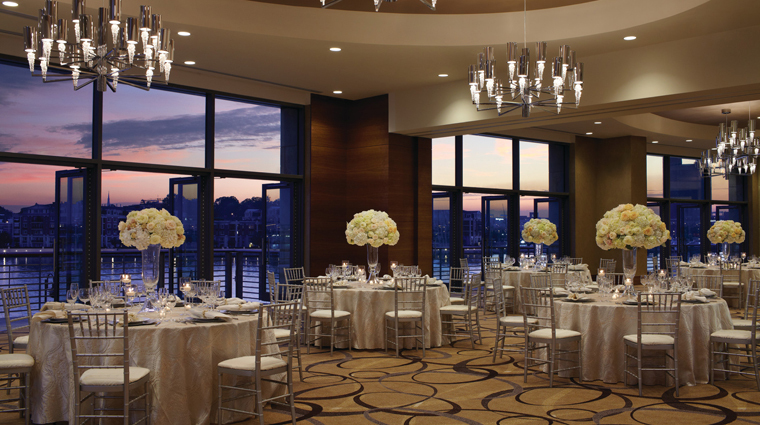 The Four Seasons Hotel Baltimore concierges know their stuff. Whether you’re looking for a classic crab shack or family-friendly afternoon adventure, the knowledgeable staff will listen to your needs and offer truly thoughtful ways for you to explore Baltimore and its environs. 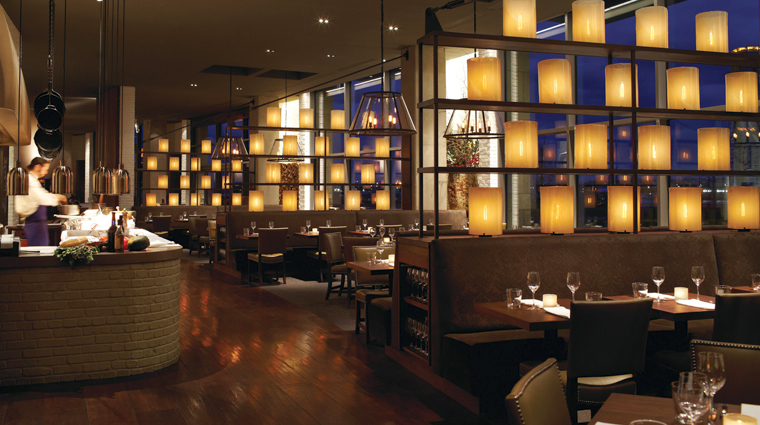 We love the contemporary Southern cuisine served at the hotel's restaurant, Michael Mina’s Wit & Wisdom. And definitely save room for dessert — pastry chef Chris Ford has won Food & Wine magazine’s People’s Best New Chef award. If you’re visiting Baltimore from out of town, you won’t need to rent a car as most of the city’s major attractions — including the National Aquarium, the USS Constellation and the Maryland Science Center — are all just a short walk away. The restaurant offers excellent tipples, both classic concoctions and modern marvels, but things can get busy with the after-work crowd. One way to avoid the throngs but still enjoy some drinking: Every Sunday, all full bottle purchases are 50 percent off in the restaurant’s dining room from 5:30 p.m. to 10 p.m.
Be sure to book time in the sauna. Go for the salt scrub and oil massage; or, if you’re pressed for time, at least take advantage of the “heat experiences” in the locker room, which includes a spacious sauna, bubbling vitality pool with metal beds, and a gorgeous mosaic tiled steam room with ceiling lights that change colors every few seconds. The infinity pool located on the hotel’s fourth floor terrace offers impeccable poolside service. 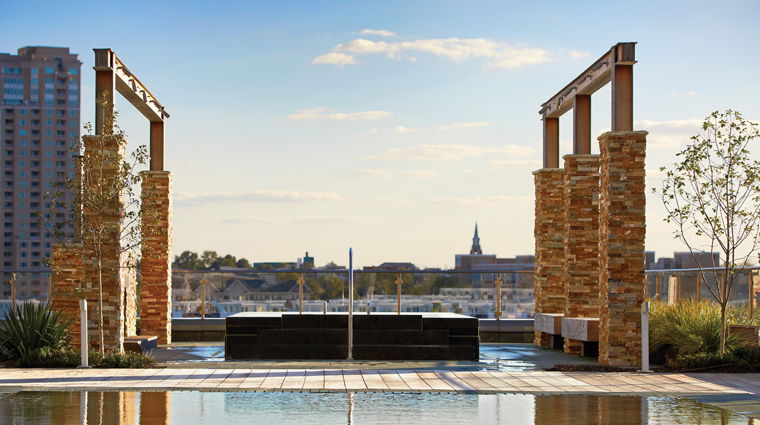 In addition to standard amenities like chair set-up assistance and towels, the staff will automatically bring you glasses of water as well as treats like frozen grapes to stay hydrated on Baltimore's hot summer days. All bedrooms feature a king size bed topped with white dobby sheets helmed by a tan leather headboard, while an over-sized arm chair lets you sit back and admire the views through the floor-to-ceiling windows. A dark wooden console holds the Samsung television and DVD/Blu-Ray player and provides storage space, while a dark wood writing desk and cream-colored ergonomic desk chair ensure that you’ll be able to accomplish all the work you brought with you. A small foyer in front of the spacious wooden closet allows for ample dressing space, and a smartly designed bar unit between the hallway and bedroom provides an area for you to mix cocktails or brew yourself a cup of coffee thanks to your in-room Nespresso maker. A dark wood accent wall introduces earth tones into the neutral space, while framed pictures in the hallway, water closet and behind the pale yellow arm chair add a hint of whimsy and color. Wit & Wisdom, the hotel’s mainstay eatery serving breakfast, brunch, lunch and dinner, is styled as a modern American tavern. Michael Mina integrates regional ingredients, comfort foods and exotic flavors into dishes such as Maryland blue crab deviled eggs and North Carolina trout with rye dumplings, cipollini onions and cucumber broth. PABU, which traditionally means “pub” in Japanese, further translates its namesake concept by declaring itself an izakaya — an after-work venue for socializing, drinking and nibbling on small plates of Japanese comfort food, proudly featuring the largest sake menu in the city. LAMILL is the Four Seasons Hotel Baltimore's European-inspired coffee and pastry café. Its inventive beverage menu features slow-extraction coffees and exotic loose-leaf tea varieties. Splash Pool Bar & Grill keeps with a bold Maryland theme—Old Bay seasoning. Favorites include the rockfish tacos with Old Bay aioli, juicy fresh-grilled handmade Angus burgers, and there’s even an Old Bay-spiced potato chip bucket.